The Upper Liberty Cap trail is located in the Colorado National Monument near Grand Junction, Colorado. The trail begins off of Rimrock Drive where it travels across Monument Mesa for 5 miles on an abandoned jeep road and meets up with the Lower Liberty Cap trail at the iconic Liberty Cap geological formation on the eastern edge of the mesa overlooking the valley below. 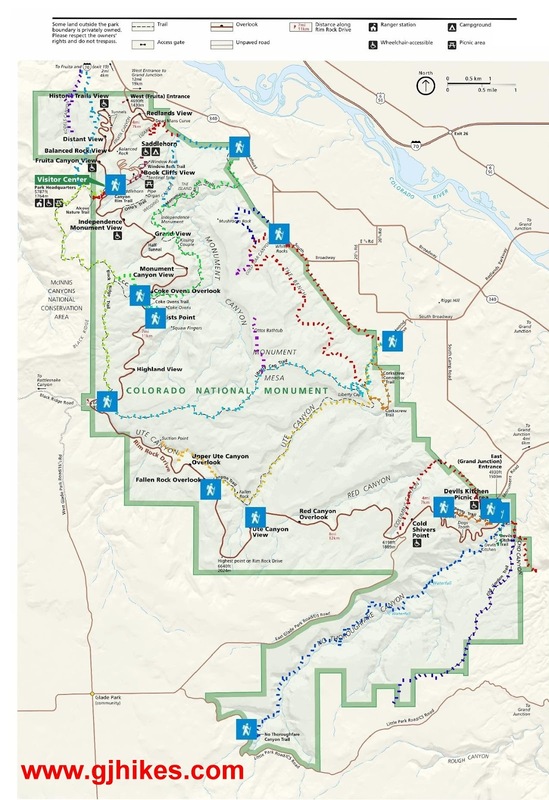 The Upper Liberty Cap trail is about 6 miles from the Visitor Center on Rimrock Drive. The trail starts out with a slight uphill pitch to it as it travels along a pleasant route through a pinion and juniper forest. A glance at the trails elevation profile reveals 4 or 5 short swells where the trail does some minor climbing only to give the elevation back once again until around the 2 mile point where it begins a long gradual descent toward the edge of the mesa. Right before reaching the Liberty Cap formation there is a much steeper descent that takes if over the rim and down to the bench that Liberty Cap sits on. As the trail proceeds toward Liberty Cap there are some nice glimpses of Monument Canyon on the left side of the trail and Ute Canyon on the right. Just past the 3 mile point the Liberty Cap trail reaches the spot where the unmarked Otto's Bathtub trail branches off on the left. Near the 5 mile point the old jeep trail comes to an end. From here the trail follows a singletrack route that takes it over the edge of the cliff and down to Liberty Cap. Apparently, back in the day, everyone drove to this spot before they began hiking. The trail gets right on the edge of the cliffs so if you have small children with you this is a good place to keep a hold on them. This is also a good place to completely avoid in the winter if there is snow or ice on the trail. The route over the edge of the cliff consists of some tight switchbacks of loose dirt and rocks coupled with some sandstone ledges that require using your hands in places. At the bottom of the switchbacks the trail travels around the cliff on a ledge that has a little exposure in at least one spot but seems to stay comfortably wide. Liberty Cap is one of the Colorado National Monuments features that perpetuates the patriotic attitude of John Otto who was instrumental in the Monuments founding and overall protection as a national resource. From this angle the geologic formation closely resembles the headware seen on the Liberty Cap coinage of the early 1800's. Since the first time that we posted the Liberty Cap trail they have added a paved parking lot and a restroom at the upper trailhead. Parking at the lower trailhead can sometimes be a problem so it is nice to have another option for getting to Liberty Cap. The lower and upper trails are nothing alike even though they both end up at the same place. The Upper Liberty Cap trail is a good choice on the Colorado National Monument for trail runners and hikers alike that are looking for some enjoyable scenery without any crowds of people. If you would like to see it for yourself then all you have to do is 'Take a hike'.